I was recently alerted to the existence of Greyladies Press which gloriously claims to publish ‘well-mannered books by ladies long gone’. I was powerless to resist and immediately purchased two books and then coerced gently persuaded the host of the Crimes of the Century reading challenge to choose one of the years in which my new purchases had been published for this month’s challenge. And so I embarked upon another new-to-me author’s work in E.M. (Ethel Mary) Channon’s THE CHIMNEY MURDER, originally published in 1929, and promptly fell in love with the decidedly delightful book. It is on the face of it one of those restrained domestic stories that English mystery writing of the era is so well-known for but underneath its polite veneer the book borders on revolutionary. It centres on two households living side-by-side in the type of outer London suburb/village that seems to populate a certain kind of novel. The Binn family is dominated by J Harbottle Binn (only his feckless brother ever calls him by his hated first name of Jabez). He is an angry, bullying, occasionally violent man whose long-suffering wife Selina and adult children Cynthia and Adrian are normally at pains to ensure that everything is to his liking so as to avoid as much of his wrath as they can. But in an act of family treason Cynthia and Adrian arrange a day-long birthday treat for their mother in which the three of them, along with their neighbour Marian Marley and her son Stephen, are to head to Windsor for sightseeing and picnicking. This adventure is to be undertaken entirely without their father’s knowledge, even after the event, as one of his many draconian rules is that their house must never be left unattended. A wonderful time is in fact enjoyed by all – especially Cynthia and Stephen who find a few moments to declare their love for each other. The next day Adrian determines to light a fire in the drawing room – even though it is only September and their father will be angry at such profligacy – but struggles with the task, producing more smoke than warmth. It soon transpires that a human arm wrapped in newspaper has been stuffed into the Binn’s chimney. And so begins the family’s descent into public infamy and personal chaos. Although I was never in much doubt regarding who the arm (and other body parts subsequently located) belonged to nor even who had put them there, I still found THE CHIMNEY MURDER very engaging as there are plenty of other mysteries to uncover and I was caught up in seeing how the various players responded to the succession of alarming events that disrupt their lives. But even though it is solidly entertaining the story is not this book’s real strength. That lies in its rather marvellous characters who evolve very intelligently which is not something I’d necessarily expect from a decades-old whodunit. The stars are its two apparently downtrodden wives who turn out to be much stronger than anyone (even themselves?) would have thought possible. Selina Binn has been bullied and verbally abused by her husband for years and initially presents as you might surmise based on that. She even lets her children cajole her into the birthday outing which she knows she ought not to participate in because she is so used to doing what others tell her. But when things turn sour – it’s not much of a spoiler to say that Harbottle Binn becomes a suspect in what the newspapers call the chimney murder – Selina comes into her own. Not only does she show us that her marriage has more to it than just ‘the bully and the doormat’ element, reminding us that we should never rush to judgement based on what we think we know about other people’s lives, but she demonstrates real strength of character and ultimately turns the tables – ever so politely – on her husband. Honestly I felt like standing up and cheering at a couple of points. Marian Marley is tested in different ways – living in penury for most of her life before learning a horrendous secret about her husband that has lasting consequences for her own future – but she too refuses to let this grind her down. I’m often found lamenting the depiction of female characters in my classic crime reading so it was an utter delight to discover such well-rounded and feisty women in a book that’s not far off a hundred years old. The men are not left out of the character development stakes though as Adrian too is shown learning to stand up to his bully of a father. Mr Binn meanwhile undergoes the opposite kind of metamorphosis and that too is sensitively depicted. There are plenty of things which remind the reader that the events being depicted in THE CHIMNEY MURDER are taking place in 1929, not least of which are the social attitudes on display, but the book never feels dated. Indeed at times it seems to have a thoroughly modern sensibility. Partly this is due to the presence of my two newest literary heroines (and Cynthia too who is no slouch in the standing up for herself stakes) but there are other elements including an undercurrent of really clever humour. For example there’s a minor thread involving the Binn’s other next door neighbour who is a malicious gossip but the police inspector working on the case puts her in her place very smartly in a scene guaranteed to bring a smile to the face of anyone who’s ever encountered such a gossip. In short I completely adored my first foray into the output of the Greyladies publishing house and can thoroughly recommend THE CHIMNEY MURDER to those who enjoy a classic crime novel with heart and humour and some truly memorable characters. 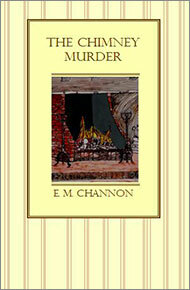 This entry was posted in book review, E.M. Channon, England and tagged Crimes of the Century. Bookmark the permalink. So glad you liked it, it sounds fab and will definitely be in my next order from them. I do have a different one lined up. If you’d hated it I would’ve taken no responsibility, but as you loved it I will generously accept the credit for introducing you to Greyladies. That seems perfectly fair Moira, conversely I would not have blamed you if I didn’t like the book. Promise. No fear on that front here though – I am quite besotted. Glad to see you enjoyed the book. I too liked the female characters in the book and like you felt that the story had quite a modern feel to it in some respects. What other books from this press do you have? So far the only other one I have is Josephine Pullein-Thomson’s Gin and Murder. Like The Chimney Murder I had never heard of it or the author but loved the blurb. I’ve got my eye on a couple of others too but the exchange rate for the Aussie dollar is a killer so I’ll need to wait a bit. So weird. I read how much you enjoyed it but somehow went to the comment from the last book and could not figure out why no one wanted to read it after your review. Now I see my mistake and yes, it does sound good and yes, that last one does not. What a discovery. Good female characters are always a plus.